These Glazed Pork Chops are AMAZING!!! My 10 year old son, is seriously the pickiest kid i know and he probably eats a minimum of 15 foods if that!!! I sat these in front of him for dinner last night and he ate every single bite!!! i was SHOCKED!!!! For these glazed pork chops, I made a basic rub out of brown sugar and spices. The brown sugar turns into a nice sweet glaze when it’s cooked and you can pretty much season it with whatever herbs and spices you like. I went for spicy with cayenne and black pepper then rounded it out with paprika and garlic powder. A little salt for good measure and it was good to go! Super easy and very tasty. 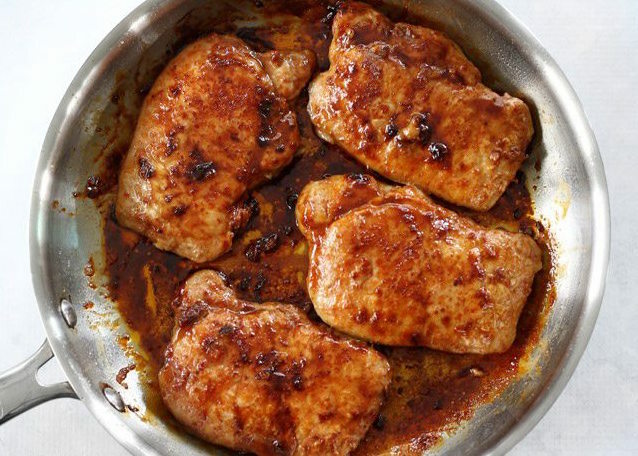 This Glazed Pork Chops recipe is a great week night main dish! Preheat the oven to 350oF. In a small bowl, combine the brown sugar, cayenne pepper, garlic powder, paprika, salt, and black pepper.